Living in the desert, my color-treated hair has a tendency to get too dry and frizzy, especially in the winter months. RIKOKO to the rescue. The company sent me their just-launched products to try and I started using the new line a few weeks ago — my hair hasn’t looked this shiny and smooth in a long time. The secret ingredient: coconut oil. During the last few years, we’ve all heard it being touted as having numerous health benefits for our hair, skin and diet. I’m sold — it is a wonder ingredient! These yummy-smelling, sulfate-free products claim to be nourishing for your hair and they are. The RIKOKO line includes Lock Shampoo, Lock Conditioner, Kokobalm, and the Prism/Leave-In Conditioner comes in five different shades. We tried the “Opal” Leave-in Conditioner — ideal for any shade of hair to enhance your color and shine. As the website states, it’s like lip gloss for your hair! This line is especially good for color-treated and multi-cultural hair, although my daughter’s hair is neither and I used it on her too and the result? Super shiny, smooth tresses. The coconut oil works to seal the cuticle, protect the hair shaft, and prevent your color from fading, as well as quench parched hair. Other product ingredients include vanilla extract, purifying cinnamon bark (Lock Shampoo), wild ginger, softening hibiscus (Lock Conditioner), lemongrass, natural oil blends (Kokobalm), vetiver and passion fruit (Prism/Leave-In Conditioner). Oh, and the sleek packaging looks so pretty on your tub or in your shower — bonus! It’s important to me that the hair products my family and I use are free of harmful ingredients and these fit the bill. 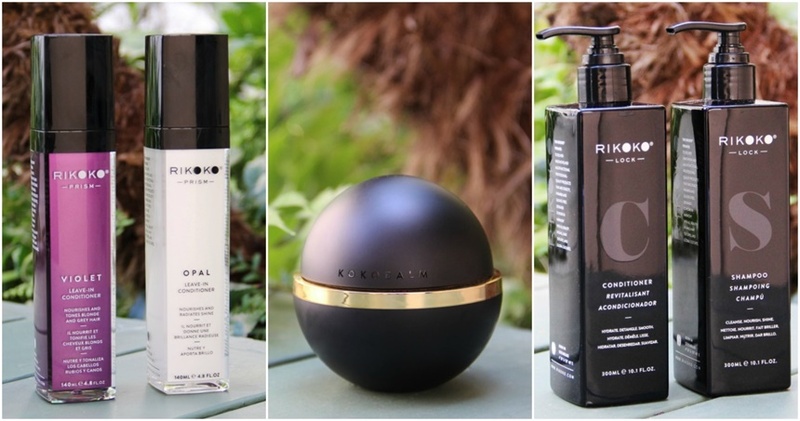 Two years and a lot of thought was put into the development of RIKOKO by the brand’s founders, experienced chemist Sheree Ladove Funsch, and husband and wife duo — expert colorist Richy Kandasamy and branding guru Renee Cascarina. I am a fan and look forward to watching this company make its mark in the hair care industry!